Talk about kicking people when they're down. 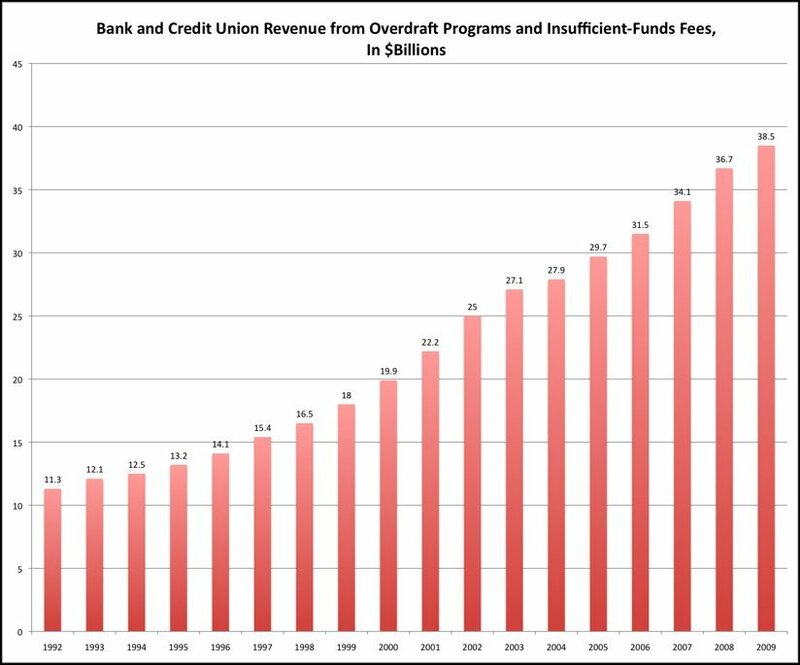 Banks and credit unions made an eye-popping $24 billion in overdraft fees in 2008, according to a report released Tuesday by the nonprofit Center for Responsible Lending. That's a 35 percent increase from 2006. The report estimates that about 51 million people were affected - meaning that one in six Americans were hit, on average, with $470 in overdraft fees last year. The fees, which banks levy when approving check, debit card and ATM transactions despite a customer's lack of sufficient funds, have become a source of big business for financial institutions: nearly half of all banks and credit unions make more money from overdraft services than they make in profits, according to Moebs Services, an economic research firm. The firm estimates banks will make $27 billion off overdraft programs this year, and says this is the first time banks have raised their overdraft fees during a recession. While billed as a convenience for customers who otherwise would see their purchases denied, the practice amounts to little more than a trap for consumers who don't know the precise dollar amount in their checking accounts, consumer advocates say. Banks typically enroll consumers in these programs automatically. In addition, when it comes to tallying the fees, some banks post debits from the highest amount to the lowest, rather than chronologically, so a $4 purchase at 10 a.m. at Starbucks is posted to the account after a $68 dinner bill that created a negative balance, making each subject to a fee. A number of lawsuits argue that the banks do this intentionally to increase overdraft fees, thereby boosting profits. It's a phenomenon that regulators and legislators are trying to beat back after years of failed attempts. The Federal Reserve is mulling new rules, and Representative Carolyn Maloney (D-N.Y.) introduced a bill in March that calls for consumers to be alerted every time a debit card purchase would overdraw an account. Senator Chris Dodd (D-Conn.) is expected to introduce similar legislation. Sensing the heat, some banks have begun to pull back. Bank of America, JPMorgan Chase and Wells Fargo announced changes to their overdraft programs. One such move: finally allowing customers to opt out of the service. A recent survey of 679 adults by Consumers Union, the nonprofit publisher of Consumer Reports, found that two-thirds of bank customers said they preferred to expressly authorize overdraft transactions. The bank lobby has been fighting proposed government oversight of overdraft programs for years. In 2007, the American Bankers Association testified before Congress, "specifically oppos[ing] proposals to require an opt-in for customers to have overdrafts paid or authorized, calculation of an APR for overdraft fees, and disclosure of a potential overdraft at the point of sale or ATM," according to the group's Web site. Those are the three things consumer advocates and certain members of Congress have been demanding for years. 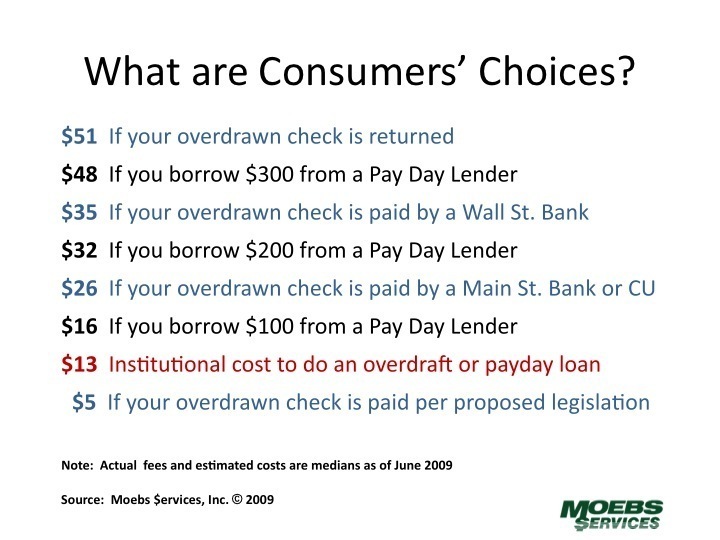 In May 2008, federal banking agencies proposed rules governing overdraft charges, including prohibiting banks from charging overdraft fees unless consumers were provided an opportunity to opt out and failed to do so. The "ABA vigorously opposed this regulatory proposal," the group's Web site notes. While the proposed rules were open to public comment, the Independent Community Bankers of America, another bank lobby, circulated a memo to its members urging them to send their comments to the federal agencies. Among the key points for the banks to consider when writing the agencies were "most customers welcome overdraft protection" and "requiring the opt-out notice in every statement cycle there is an overdraft is information overload for consumers and unnecessarily expensive and burdensome." The ICBA noted that disclosing fees should be enough and that an annual opportunity to opt out of overdraft protection was sufficient. When it comes to overdraft fees, big banks charge the most. Banks with at least $50 billion in assets charge about $35 per overdraft, according to Michael Moebs, the founder of Moebs Services. Smaller banks charge about $28. But smaller banks will typically reverse the fee for customers in good standing, he adds. "If people have a problem with their account and they're not abusive, if they're at a community bank [the bank] would refund you the money -- guaranteed," Moebs says. "That's why I tell people to have their accounts at community institutions." Lilia Lopez-Rahman is one of millions of Americans who were hit with overdraft charges last year. A retired pastor living in Hawaii, Lopez-Rahman, 70, thought she'd have no trouble last fall refinancing her mortgage for a lower monthly payment. But her lender saw a problem: Lopez-Rahman had a negative balance of hundreds of dollars on a Bank of America checking account she thought she'd closed in 2007. After a series of phone calls, she discovered that the bank, after cutting her a closing check for the account balance, had apparently continued to charge $1.74 per month for accidental death insurance. "When the account turned negative, the overdraft protection then deposited $100 [into] my account," said Lopez-Rahman, 70, "They kept on charging this overdraft protection." Fees to cover the unwanted insurance piled up in the account she thought was closed. Then debt collectors started harassing her for $386 they said she owed the bank. With her credit score ruined, refinancing the mortgage was no longer a possibility. In its report, the Center for Responsible Lending calls for a number of changes, including improved disclosure of the true cost of overdraft programs, fee limits and getting banks and credit unions to provide customers with a warning every time they are in danger of overdrawing on their accounts. Additional reporting by Arthur Delaney. HuffPost readers: Have you been hit with outrageous overdraft fees? Let us know your story. Email arthur@huffingtonpost.com.